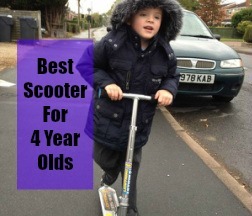 What Are the Best Scooters for 4 Year Olds? What Else Should I consider When choosing a scooter? When buying a scooter for a 4 year old girl or boy, perhaps the most important question to ask is whether you should get 2 or 3 wheels. The answer will be very much dependant on the child in question and the features you require. If your child has had experience of a 3 wheel scooter and are confident in riding one, I would definitely consider graduating onto a wheel scooter. My eldest son and nephew both received 2 wheels for their 4th birthdays and they both enjoyed riding them straight away. A less confident child or those that are new to getting a scooter may prefer 3 wheels. Firstly there is the mini micro scooter. The mini micro is designed for kids between ages 2 and 5 and with a weight limit of 45 pounds. It's a good choice of 3 wheel scooter for many 4 year olds and you can read more about it on the 3 wheel scooters page. I have bought this one for my younger son. He is now 4 years old and coming up to his 5th birthday. He is quite small for his age (around 1 metre tall). He still rides this scooter daily and I think it will definitely last him another year. In quick summary the micro scooter has polyurethane wheels which offer a really smooth ride. The 120mm sized wheels are the front are slightly larger than standard wheels and area a great size for cruising. The footplate is flexible fibreglass and reinforced footplate to absorb bumps in the pavement. The handlebar is adjustable from 49cm to 69cm from the ground. The scooter weighs just 3.3lbs or 1.5kg. A lightweight scooter makes it easier for young children to lift and control the scooter which it is essential for them to do when they are picking it up to go up kerbs etc. ​It's also easier for adults to carry when required too. If you're buying for a 4th birthday and for a smaller 4 year old, it's possible to get 2 years use out of this. scooter quickly and for this reason it's also worth considering the maxi scooter. The Maxi scooter is a 3 wheel scooter that's designed for 6 to 12 year olds, so is the follow on from the micro scooter. It's handlebar is adjustable from 67cm all the way up to 93cm. It's lowest height is only about a cm bigger than the handlebar on the mini micro scooter, but it will grow with your child for many more years. Like the micro, the maxi has polyurethane wheels which offer a really smooth ride. It's heavier at 2.5kg compared to 1.5kg, so it is heavier to carry around. It's also more expensive but it will last a number of years. The maxi and mini micro scooter are both very high quality and have had years of tried and tested use with excellent reviews. If you would like one for your child but you're not sure which one to get, check out this comparison of the mini micro scooter vs the maxi scooter. Another option of 3 wheel scooter that is worth considering is the 3style scooter (featured below). The main selling point is it's height adjustable handlebar so you can make sure it's the right height for your child. The 3style scooter has some excellent features and scores very highly on affordability too. It is cheaper than a lot of similar styled scooters. The handlebar is adjustable from 52cm to 86cm so will grow with your child. A handlebar should ideally be around waist height on a child so this scooter should offer the perfect height for a 4 year old. A too low handlebar can mean your child is hunched over so it's uncomfortable to ride. If the handlebar is too high it can make the scooter difficult for them to control. There is a folding mechanism which is great when little kids have had enough of scooting. It can then be folded up and carried. It's also easier to store, put in your boot or carry on top of a pushchair of a sibling.It does weigh heavier than more expensive scooters such as the mini micro due to extra weight of the adjustable handlebar and folding mechanism. However, it is still fairly lightweight compared to other options and this weight should be fine for a 4 year old. The wheels are made of polyurethane and 120mm in size. Bigger wheels don't absorb the shocks from cracks and bumps on the pavement and glide over them more easily. The bigger wheels also mean that you can cover longer distances more easily (less kicking required). This makes scooters with larger wheels great for the school run! One thing little kids will love is that the wheels light up. Check out more 3 wheel scooters for younger kids and 3 wheel scooters for older kids. The is great choice for 4 year olds as the handlebar can be adjusted a huge amount with five different height settings from 62cm to 90cm. This means the scooter has the capacity to last them for years. The rider weight range is 20kg to 80kg. The features on this scooter mean that it can easily be shared between siblings of different heights and small adults can even have a go. It features 120mm front PU wheels and a rear 100mm wheel. Kids this age will love the LED coloured flashing light on the wheels. The scooter is also foldable for easy storage and to fit in the boot of the car when needed. One of the downsides is the scooter weighs a little more than the maxi micro and other lightweight scooters due to the height adjustable handlebar and folding mechanism. So if you're looking for a scooter that you wand to be able to fold and carry when your little one has had enough, there are lighter options. It has a lean to steer mechanism which is fairly common on 3 wheel scooters at the moment. So riders, lean left to go left and right to go right. Where this scooter scores highly is the price. It's cheaper than the maxi micro and with excellent features the lower price point makes this one even more appealing. JD bug is one of the bestselling brands of scooter in the UK.It's a brand known for its quality and durablilty. It has an age recommendation of 4 to 8 years and is perfectly sized for this age group. The JD bug junior is the perfect 2 wheel scooter for a 4 year old who is ready to graduate onto 2 wheels. The maximum weight for the scooter is 50kg so it should last 4 year olds a few years. It features 120mm wheels with ABEC 5 bearings. The wheels are a great for cruising and offer a smooth ride. It features tough durable wheels (durometer 88a - to find out what this means check out the scooter buying guide for kids.) Higher end scooters will often give the wheel durometer and 88a is a good headwearing, durable wheel . There's a folding mechanism which will make it easier for adults to carry on the school run. It weighs 2.3kg or 5lbs 4 ounces. It comes in different colors (pink, red or blue) so a choice for 4 year old boys and girls. The handlebars are height adjustable.The minimum handlebar height is 63cm and the maximum handelbar height is 84.5cm so plenty of room to grow with your child making it perfect for this age range. The footplate is also a bit smaller than standard (44cm by 9cm) making it a good choice for younger riders too. The Weskate scooter is similarly priced to the jdbug and is aimed at kids aged 3 to 10 years. It's a fairly new addition to the scooter market. The handlebar is height adjustable to three different heights at 70cm, 75cm and 85cm. It quickly folds and is easy to carry. The wheels are 120mm and will light up when going round. It's a lightweight scooter at 2.4kg, so not too heavy to carry if needed. It has a footplate which measures 40cm by 9.8cm which is about 10cm shorter than standard scooter and about the same width as on a standard sized scooter. We bought the Ozbozz Lightning Strike for our elder son's 4th birthday who was on the tall side for his age. The lowest height setting is approximately 71 cm from the ground to the top of the handlebars so it is better for tall kids. It has 3 adjustable height settings up to 81.5cm on the maximum. I would say this is a great choice if you are on a budget. My son definitely loved it and it lasted a couple of years for us. I have written a full review of the Ozbozz Lightning Strike too. If you're looking for a scooter that will last, it may be worth spending a bit more. The micro sprite is a good 2 wheel scooter. (Its made by the same people who make the mini and maxi micro scooters above).It has a height adjustable handle (from 63cm to 96cm) so will grow with your child as they get older. The construction and design of the scooter is very good. It has a bigger front wheels to make cruising easier and the ride smoother. The wheels are made of PU (offering a really smooth ride) with ABEC 5 bearings. Its a great beginner scooter. The recommended age is from 5 years and up but there are reviews of 4 year olds using this. The lowest height on the handlebars should be fine for most 4 year olds. It weighs 2.7kg which is on the heavier side, so it would be harder for adults to carry. However it is foldable which will make it easier and better for storing too. I also think a 4 year old who's capable of riding on 2 wheels will be fine on this. It comes in several different colors including blue, red, black and pink. Check out more details on the 2 wheel scooter page. My nephew is spiderman crazy so loves his spiderman scooter which is exactly the same as the one opposite. He had been using a 3 wheel scooter for a while but received this one for his 4th birthday and just used it straightaway without any problems. What I like about this scooter is that it folds. This is great when the kids have had enough as it's easy to carry back to the car or back home. ​It also features an adjustable handlebar height so will grow with your child. ​What you may compromise on (that you may get from the more expensive scooters) is the smoothness of the ride. The ride may be a little more bumpy. Having said this, my nephew doesn't seem to notice and really does love the scooter. It also features foam easy-grip handles. If you have a daring and very competent 4 year old who wants to have a go at a few tricks (perhaps they have an older silbing they want to copy), it may be worth getting a dedicated stunt scooter. Stunt scooters are stronger than kick scooters to withstand the extra impact. It is difficult to get stunt scooters for kids as young as 4 years old. Most start from age 8 but there are a few for kids from age 4 and 5. If you would like a stunt scooter for a 4 year old, check out the madd gear mini pro x scooter and the Grit mini fluxs pro featured below. The Madd Gear VX7 mini pro scooter is the idea first stunt scooter designed for the smaller rider with smaller hands and feet. It features a smaller deck than standard (at 10cm wide and 43cm long), one piece bar and anodised alloy core wheels with high rebound urethane (perfect for any jumps and tricks). 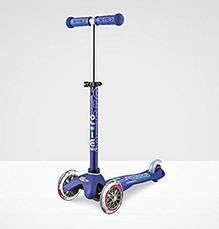 It is aimed at age 5 plus but if you're looking or a 4 year old this is still a good choice of stunt scooter for this age group. It weighs 3.5kg which light for a stunt scooter and lighter than it the full sized pro x scooter. However, if you compare it with kick scooters designed for younger children it will weigh quite a bit heavier.​ This is due to the tougher construction needed for a scooter which can withstand the tricks and jumps. 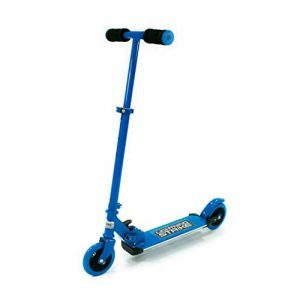 This is a excellent stunt scooter with top notch features designed for younger children within an age range of 4 to 8 years. It has a smaller bar and deck than standard sized scooters for the smaller rider. The wheels have an alloy cast core to withstand the extra forceneeded when doing jumps and tricks. They are 100mm 88a PU wheels with ABEC bearings so are hardwearing and durable giving a smooth and fast ride. The mini Gritt Flux weighs 3.3kg which is light for a stunt scooter meaning it's easier to manage for little kids. The Bike Star Kick scooter has pneumatic tyres so is an excellent option for kids who want to scoot on grass or uneven surfaces. The pneumatic tyres give a smooth comfortable ride so kids especially when going over sticks, stones or bumps in the path. It's quite good for getting kids used to how things works on a bike as in addition to they tyres, there is a hand brake and the scooter is easy to steer. They tyres are 10 inch. The scooter is durable and hardwearing. It is heavy so at 6.2kg, it's not one that parents will be wanting to carry. Height of the child in question - The height of the child may also be a deciding factor in which scooter you buy. The scooters featured below all have different handlebar heights. Some scooters feature quite low handlebar settings for smaller 4 year olds whereas others have slightly higher handlebars. Ideally you would like the handlebar to be about waist height on your child.